The history of the Recreation Ground starts properly in 1901 when Francis Greg Esq. JP died and left the Cricket Ground, as it then was, to the people of Bollington to be administered by Bollington Urban District Council. It was one of a long line of services to the Town provided by the Greg family starting when Samuel Greg junior bought Lowerhouse Mill from the Philip Antrobus estate in 1832 and improved the lot of the mill workers up to 1846. Francis Greg was his nephew living at Samuel’s original home, Turner Heath, a large red brick house still in existence on the Bollington road as you enter the town from Macclesfield.Francis Greg had been a strong supporter of cricket in Bollington. The club based on Gnat Hole, as his ground was then known, had started about 1885 by bringing together smaller clubs in Shrigley Vale and Bollington Cross. Francis generously provided a pavilion, a bandstand and paid £20 for a roller to make sure the summer wickets were properly prepared. The Bollington Cricket Club were mindful of their good fortune and encouraged other activities. From 1896 the Club organised an Annual Athletics Meet every Whitsun which grew in importance as a money spinner for the Club and by the early 20th Century gained the reputation for being one of the best amateur sports gatherings in the North of England. The change in status to a public recreation ground in 1901 caused a great deal of controversy at the time because footballers naturally wished to use the ground during the winter months. Traditionally the famous Bollington St. John’s Team based on the congregation of St. John’s Church had used the eastern end of the Cricket Field during the winter months. This came to an end in 1901. In the early years the Cricket Club prevailed and footballers were excluded due to the political influence of the cricketers on Bollington Urban District Council (BUDC). The BUDC built a Bowling Green beyond Francis Greg’s Bandstand where the footballers traditionally played. In addition in 1908-09 they built a new entrance on Palmerston Street with a memorial plaque in honour of Francis Greg. The current plaque is a replacement made in the 1990’s. Footballers were banished. Bollington St. John’s, soon to become Bollington United, petitioned the Council in 1913 to provide a football ground. The Council was now more sympathetic but the footballers had to wait until after 1918 when the River Dean could at last be diverted to its present course to provide space for their pitch. 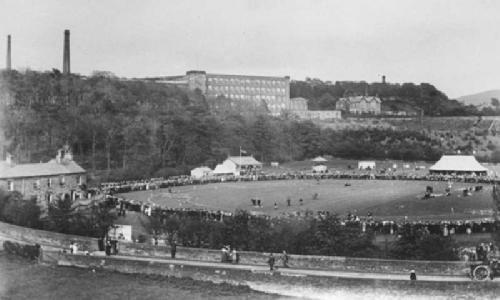 Cricket has always been the dominant use of the recreation ground for sport. The glory days of Bollington Cricket on the Recreation Ground were before the First World War. In 1905 the Macclesfield Courier carried the report of an astonished journalist: ‘Fancy a village of 6000 challenging and playing a city like Manchester with a population of over 60 times that.’ When the Cheshire County Cricket Club was formed in 1908 a number of County matches were played on Bollington Recreation Ground. Big local industrialists like E.L.Oliver of Waterhouse Mill fame, and G.H.Swindells who owned the Clarence and Adelphi Mills were strong supporters. They supported the creation of a Workshops Competition but in spite of this strong local interest the Club’s prominence on the County scene declined. The Recreation Ground Committee of BUDC charged Bollington Cricket Club £85 in 1956 for the preparation of match and practice wickets. Bollington Cricket Club Secretary, Mr. A.A.Arnold, in April 1958 at their Annual Meeting described the club’s achievements on the Recreation Ground. “The Pakistan Eaglets were going to visit. A new Tea Pavilion had been opened and the club’s Second Eleven won the Second Division Championship.” When the Pakistan team visited in August 1958, Mohamad Ramzan, their captain, scored 66 in record time. September brought success to the First Team, they were champions of the Lancashire and Cheshire Cricket League and winners of the Saville Whittle Trophy. Prize money of £45 was spent on commemorative Tankards for the players. In November the Council turned down the Cricket Club’s request to have a Sunday match. The Recreation Ground has been host to many famous cricketers. The Australian Test player Keith Stackpole (43 Tests 7 centuries) visited with Ramsbottom Cricket Club in a friendly match in the late 1960’s. Frank Hayes, who scored a maiden Test century against the West Indies in 1973, visited Bollington Recreation Ground many times with Marple Cricket Club. Cricket is still one of the strongest elements in the sporting life of Bollington. The Bollington Cricket Club has competed in the Cheshire County League since 2002. As the Chairman says, “We rub shoulders with clubs from Towns with much larger populations [Bollington is a town of some 7000 souls] as well as wealthy clubs with ‘no expense spared’ facilities. The people of Bollington can be rightfully proud that this town produces such a competitive standard of cricket.” Three Senior and five Junior elevens compete regularly during the summer months and practice all year round. Bollington Cricket Club has been awarded Sport England’s Clubmark recognising its all round excellence and is currently acting as a Focus Club for the Cheshire Cricket Development Programme. One important though unplanned contribution the Recreation Ground made to the life of the Town in the early 1900’s was that of drawing attention to the foul state of the River Dean. Early photographs and maps remind us that the eastern end of the Recreation Ground has a complex drainage system which still challenges users today. The River then wandered into the far corner of the Recreation Ground and curled over what is now the Football Pitch before taking a sedate path alongside the Cricket Pitch and leaving under the Adlington Road Bridge in the south western corner. In addition a mill leat flowed straight down the southern edge of the ground. Francis Grafton, an unacknowledged benefactor who lived at the large stone house known as Barley Grange near the entrance to Flash Lane at Bollington Cross, provided two rustic bridges in 1908. One crossed the mill leat and another crossed the River Dean. The leat has long been filled in and covered by a pathway. The rustic bridge was washed away in a flood in 1933 and has been replaced by a handsome metal structure. This has recently been renewed and repainted. As part of the preparation for the Green Flag application. By the 1890’s when Gnat Hole entered wide public use over 300 cess pits drained directly into the River Dean. Complaints flooded into the Health Authority and then the Bollington Urban District Council from people using the Recreation Ground. The stench was awful and visible faecal matter clogged the River. 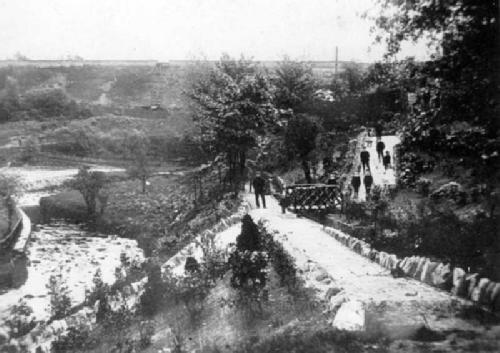 An inspection eventually occurred in 1899 and the then Medical Officer of Health declared the river “nothing but an open sewer.” The Council still refused to raise the money necessary for a pure water supply and a proper sewage works. It required two prosecutions to force their hand and the sewage works was opened in 1906 much to the relief of all those who enjoyed the use of the Recreation Ground. As well as being a sporting venue throughout its history the Recreation Ground has reflected the needs of the community and has played a central role in the life of the Town. The earliest public celebrations were those to welcome the Coronation of King Edward VII in 1902 and King George V in 1911. There are photographs showing huge crowds dressed in their Sunday best with men in three piece suits and women in long dresses and splendid hats crowding the grounds. 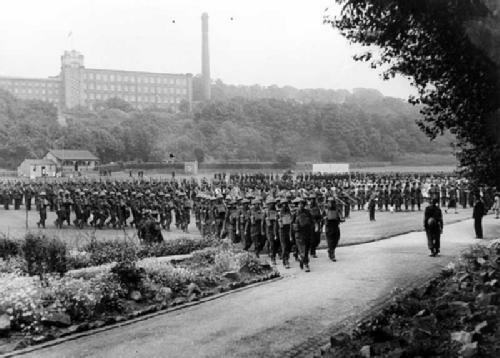 During the First World War it was used as a parade ground and during the Second World War part of it was dug over and planted as Bollington’s contribution to the Dig for Victory Campaign as well as being used to train the Home Guard. Carnival Time in the 1950’s saw the Carnival Queen in regal dress with her train being held out of the mud parading in lonely splendour across the Recreation Ground watched by huge crowds. In 1955 the 16 year old Doreen Bamford was chosen to represent Bollington. Doreen went on to be chosen as the National Carnival Association’s Beauty Queen for that year after an embarrassing incident that hit the national press when Miss Nantwich was awarded the crown by mistake. The judges were firm of purpose and eventually Doreen enjoyed her year of national fame. 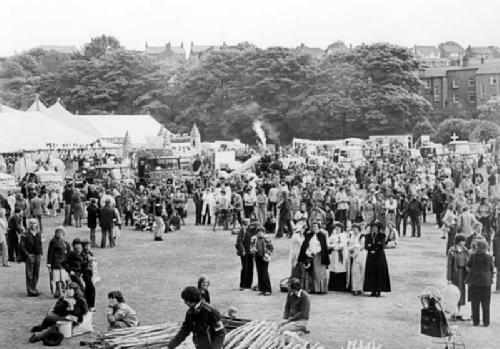 In 1964 the Recreation Ground hosted a new development that has become a central feature in the community life of Bollington people – the Festival. This was the brainchild of Father Derek Smith the curate at St. Oswald’s Church and it was quickly taken up by Drs. John and Jean Coope and the historian of Bollington, Margaret Ingram. The Festival was to start with a Carnival Parade and then there would be a series of events planned for the Recreation Ground. Jim Renton arranged for the big tent for that first festival to be erected. Bollington weather intervened and after a few days of heavy rain the tent collapsed on top of a festival feast!! Luckily volunteers were quickly found to put all back to rights and the WRVS led by Binkie Renton and Ida Kershaw set up a field kitchen and brazier to provide the feast. Since then Festivals have been held every four or five years. For three weeks in May the Recreation Ground hosts the Festival Tent with concerts, comedy nights and in 2009, for the first time, an opera. During the 2005 Festival 35 events were hosted at the ground or in the big top including comedy, orchestral works, an ecumenical service, the Verdi Requiem, the Bollington Brass Band and the opening and closing ceremonies including a fireworks display. The 2005 Festival had the biggest tent yet and its erection and impact on the ground caused a hot debate to develop about whether such a structure was appropriate on a ground heading for Green Flag status. Luckily after much effort and an expensive resort to insurance this debate has now been settled and future Festivals can be centred in its traditional place on the Recreation Ground. In later times new challenges have appeared for the Recreation Ground and its place in the life of the Town. Since 1974 Bollington has lost direct responsibility for the Recreation Ground which, with the demise of Bollington Urban District Council, moved to Macclesfield Borough Council. Inevitably a desire for efficiency meant that a peripatetic visiting team of maintenance workers replaced the dedicated group of local Bollingtonians who looked after the Recreation Ground. The challenge of improved home entertainment and the loss of the great working communities and competitive spirit built on the social and working life of the Bollington Mills meant that the large crowds attending sporting events disappeared. The Recreation Ground began to be neglected. Serious problems in relation to basic services such as the toilets, the amount of litter and dog fouling developed. In 2003 Macclesfield Borough Council commissioned consultants Design Plus to develop a strategy for all its parks and green spaces. As part of this strategy a redevelopment plan for Bollington Recreation Ground was produced which provided the blue print for regeneration. As a result a Friends of the Rec group was formed in 2005 in partnership with Macclesfield Borough Council. A number of dedicated local people led by local Councillor John Kershaw and Borough Councillor Sylvia Roberts entered into a sustained partnership with the Borough Council. The aim was to return Bollington Recreation Ground to the standard that local people could take pride in and that would support those who continued to need the ground for their sporting activities. The aim was to be achieved through attaining the coveted Green Flag status for Bollington Recreation Ground. 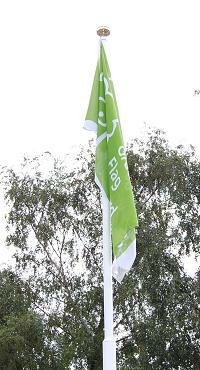 The Green Flag has been the national standard for parks and green spaces in England and Wales since 1996. Macclesfield Borough had no green spaces with Green Flag status and it is a credit to them and the Friends of the Recreation Ground that the Green Flag was awarded after only three years of work in May 2008. The work done was spectacular. New fencing was erected at the bottom of the tiered grass viewing embankment on the south side. A hand rail has been fitted adjacent to this embankment. All the gates at the Palmerston Street and Adlington Road exits have been removed and restored. A new pedestrian gate has been fitted in the Adlington Road wall to link the park with the play area. The old toilet block was given a complete facelift to make it pleasant to use. To our shame local vandals have damaged the toilets since their refurbishment adding to the expense of the project. New fencing has been fitted around the bowling green. The tennis courts have had their surfaces remarked and are now maintained to a high standard. Best of all we have two dedicated grounds staff, Jim and Sam, whose main task is to keep the Recreation Ground up to the new high Green Flag standard and to help implement plans for the future. It was their idea to expose the lovely wall at the back of the Bowling Green which makes picking up the litter a lot easier! New seating and litter bins have been installed. The woodland walk has been improved and made more interesting with tree trunk carvings created by chain saw! This is the work of one of the Borough Rangers, Ed Pilkington. As part of the successful Green Flag application Macclesfield Borough Council agreed to their consultants producing an extensive and detailed Management Plan for Bollington Recreation Ground which is currently being updated. The Friends of the Recreation Ground expect to play a full part in helping to energise the community in supporting their Recreation Ground as the central facility for encouraging a healthy life style, an appreciation of nature, the enjoyment of entertaining activities, increasing community spirit and as a place for tranquil reflection. We look forward to many years of maintaining the Green Flag flying in the heart of Bollington.